The US and Canada arm of tripod manufacturer FLM is planning to introduce a new carbon fibre tripod with a maximum load capacity of 40kg/88.18lbs, but that that weighs only 2.25kg/4.96lbs itself. The forthcoming Berlin 38.4 has four-section legs made from 10-layer carbon fibre and an apex that accepts a flat screw plate or two sizes of leveling bowl. FLM has launched the Berlin 38.4 on Indiegogo in the second of its crowdfunded projects—the company has already successfully launched the CP26-Travel tripod this same way. It hopes to raise $9,500 to get production underway, and says it has already completed prototyping for the legs. 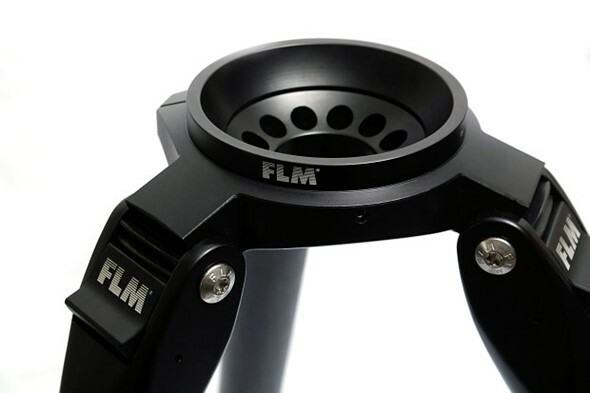 It is unusual for a tripod apex to be able to handle more than one size of leveling bowl, but FLM says the Berlin 38.4 can be used with both 75mm and 100mm bowls via adapters. Leveling bowls are ideal for video users, while most stills shooters will want the flat base plate so a normal tripod head can be attached. With no centre column, the Berlin 38.4 stands at a maximum height of 143mm/56.29in, but can support the camera from 8cm/3.14in off the ground via the three-position legs. It folds to 52cm/20.47in and the widest leg has a diameter of 38mm. FLM expects the Berlin 38.4 to retail for $809, but is offering it to crowdfunding backers for packages starting as cheap as $558. For more information, visit the Berlin 38.4 Indiegogo campaign page.